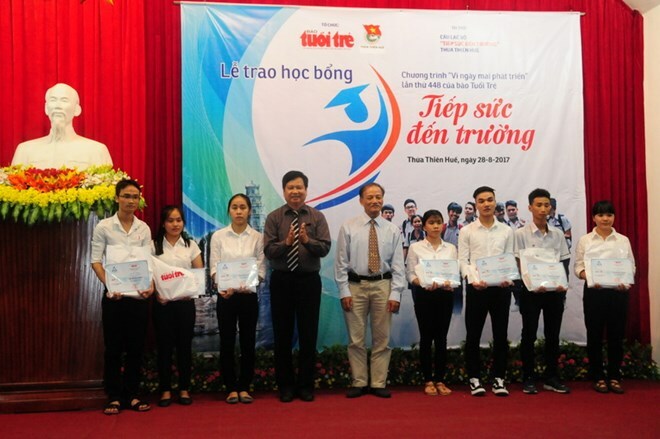 Hanoi (VNA) – Some 100 new undergraduate students with difficult backgrounds in central Thua Thien-Hue province were presented scholarships at an event titled “Tiep suc den truong” (Give strength to students) on August 28. The event was held by Tuoi Tre Newspaper and the provincial Youth Union in Hue city. The scholarships were worth a total 727 million VND (32,000 USD) this year, ranging from 7 – 10 million VND (308 – 404 USD) each, said acting editor-in-chief of Tuoi Tre Newspaper Le The Chu, adding that they were donated by individuals and the province’s Association for Promoting Education. Launched 15 years ago, the programme has given scholarships, worth 75 billion VND (3.3 million USD), to more than 15,000 new undergraduate students under difficult circumstances nationwide. Meanwhile, scholarships were also awarded to 450 poor students who face hardships to pursuing education in central Quang Ngai province on the same day. Ministry urges schools not to collect "extra fees"